The Department of Natural Resources, TERI School of Advanced Studies (TERI-SAS) in association with Hexagon Geospatial India organised a two day 'Training Workshop on Satellite Image Processing' from March 1-2, 2019 at the TERI SAS New Delhi campus in Vasant Kunj. Dr Nithiyanandam, Convener of the workshop, welcomed everyone and briefed them on the background of the event highlighting the Academia and Industry Partnership as a key tenet forming the basis of the programme. Dr Vishnu Chandra (Deputy Director General, National Information Center), in his keynote address, apprised the audience of the developments in geospatial technology in India, initiatives of the NIC and the exigency of satellite image processing. Dr Leena Srivastava (Vice-Chancellor, TERI-SAS) and Mr Vasudeva Rao (Assistant General Manager, Hexagon Geospatial India) were the other chief delegates who addressed the audience during the inauguration. The workshop concentrated on the basics of satellite image processing, elaborated on its application in diverse areas and provided an overview of the current/upcoming trends. Recent advancements such as drone-based image processing and 5D technologies were also discussed during the workshop. With a distinct audience comprising undergraduate/postgraduate students, young professionals and researchers from several institutions, the programme also showcased a diversity in ideas and opinions. Extending an overwhelming response to the programme, participants found the lectures and hands-on training (received during the workshop) to be helpful for identifying possible applications of Satellite Image Processing in their own fields. TERI-SAS is keen on organising similar training programmes in association with industries, in the future. TERI School of Advanced Studies organised and completed an unique one day MDP by bringing together participants and stakeholders from the entire value chain of the renewable energy sector which included mid career and senior officials from PTC Financial Services, Avaada Energy, NTPC, PTC India Limited, BSES, SECI, J K Paper Mills and many more. The one day programme ended with rich deliberations on - a) Sectoral Challenges, Opportunities, b) Credit Appraisal Techniques, c) Green Financing, d) Lending and Investment Issues, e) Operational and Legal Risks, f) Future Financing Innovations and the participants requested for conduction of frequent programmes in the above mentioned domains pertaining to the renewable energy sector. TERI School of Advanced Studies (TERI SAS) in collaboration with the Government of India Rooftop Solar Technical Assistance Program supported by the World Bank hosted the “2nd International Conference on Business, Economics and Sustainable Development (ICBESD-2019)” on January 17-18, 2019. An overwhelming response of more than 150 papers was received from eminent national and international institutes including the IIMS, IITs, central universities and other prestigious business schools. 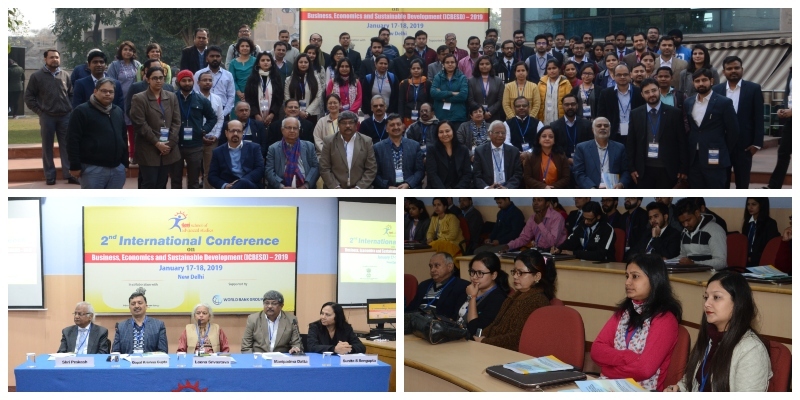 The conference comprised three panel discussions on emerging themes of health finance, circular economy, and solar rooftop systems and 16 parallel paper presentation sessions with eminent academicians, corporate leaders and policy-makers chairing the sessions on various themes relating to the Sustainable Development Goals. The conference was a unique platform for faculty, researchers, students, corporate leaders and other stakeholders to deliberate on the emerging horizons to meet the mammoth challenge of sustainable development.